Mice are active during the winter months and only need a small gap (3/8 inch) to get in. Ice chunks under your garage door can create a sizable gap, as well as the havoc salt can create for your garage door seal. This makes garage doors the perfect entrance points into your home for mice and other critters. Learn how to prevent gaps under your garage door: “How this wintry weather can give mice a direct shot into your garage“. Almost all garage doors are raised and lowered with the power of an electric motor and assistance from heavy-duty springs. But what happens when one of the springs break, are becoming worn, or need to be adjusted? What can you do? We’ll look at the life of a garage door spring and what to regularly keep an eye on. Garage doors utilize two types of springs, torsion springs, and extension springs. Torsion springs are mounted on the wall directly above a garage door when it is in the down position and work based on energy created from a twisting motion. Extension springs are located above the upper horizontal tracks on both sides of a garage door. Each day torsion springs endure extreme amounts of stress, yet they can last 4-10 years depending on how often the door is used. 10,000 cycles is a typical life of a torsion spring! Inevitably, these springs that are critical to the door’s operation will wear out and may even break. Garage doors can be very heavy so avoid injury by leaving it as it is. Don’t try to lift it. Aside from possibly injuring yourself, you also risk burning the garage door opener’s motor out when lifting the door. Call a garage door professional right away. Replacing garage door components, especially torsion springs, requires specialized tools and techniques to ensure they are installed properly. There are a few ways to tell if your springs need to be adjusted or replaced, and it’s easy enough to handle on your own. One of the most common adjustments that need to be made is re-balancing. Torsion springs can become unbalanced for a variety of reasons, which can result in uneven wear on parts, premature breaking, and mechanical failure. Garage door professionals recommend customers have their torsion springs re-balanced within two years of being installed. Also, it’s important to note springs that have been installed in cold-weather months need to be adjusted before the two-year mark. Annual lubrication of the torsion springs are also recommended (a rust inhibitor lubricant is best. Not WD 40). Garage door extension springs are mounted over each horizontal track of the garage door and counterbalance the weight of the door by providing resistance through the stretching of the springs. Since no adjustment can be made to extension springs, they must be replaced when they’ve worn out or have broken. The following points are simple ways to tell if it’s time to replace your extension springs. You can visibly tell the spring is broken, cracked, chipped, or has any damage that can cause catastrophic failure. The springs have become overstretched, and gaps have formed between the rings. The garage door lowers too quickly and has difficulty raising. The motor is obviously laboring to raise the door. The garage door is crooked when it’s going up or down. Position the door halfway up. It should stay in place. Failing these two tests means the door is out of balance and requires an adjustment. The most important takeaway from the information above is to call a garage door professional when you think there’s an issue with your system. Garage door springs can be very dangerous, even deadly, if installed by a non-professional. Everything runs a little slower in the winter—cars, equipment, and even garage doors. 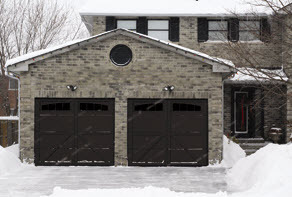 Garage doors and garage door openers are affected by cold winter weather in a variety of ways. Frigid temperatures, snow, ice and salt all take a toll on the garage door in the winter. Overhead Door Company of Cedar Rapids and Iowa City wants to ensure your garage door runs smoothly at all times during the year. 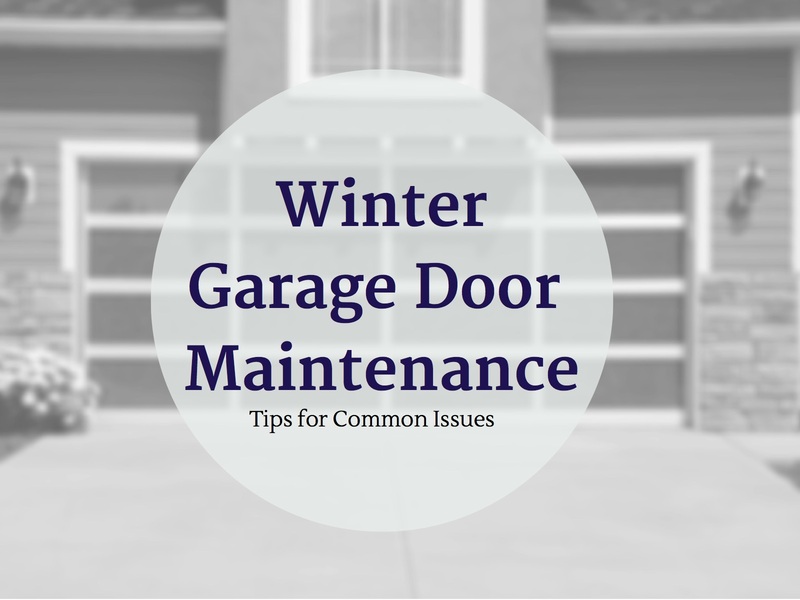 Below, we offer our best advice for troubleshooting and fixing common garage door maintenance issues in the winter. A garage door tune-up from Overhead Door is a great first step to preventing any garage door winter “down time”. It is a wise investment to give Overhead Door a call to perform a thorough tune-up on your garage door and opener system in the Iowa City or Cedar Rapids area. Our technicians will inspect, lubricate and adjust if needed all moving parts of any brand of garage door and automatic opener system. Our inspection process includes springs, rollers, hinges, cables, pulleys and drive mechanisms. A tune-up also includes the inspection and tightening of any loose hardware. We recommend an annual tune up to stay ahead of maintenance issues. Click here to learn more about winterizing your garage door, if you haven’t already. If your garage door is not opening and closing properly, it may be due to one or more common problems. These issues are more prone to happen in winter as metal parts contract and expand with warm/cold fluctuations. Broken springs, defecting rollers and door and track shifting are common winter syndromes. Contact Overhead Door Company of Cedar Rapids and Iowa City to coordinate service. As temperatures drop, heavier oil and grease lubricants have a tendency to harden up. The door and opener may run rough with more friction and squeaking. You can fix this common winter maintenance issue by applying a small amount of high quality rust inhibiting spray lubricant to all moving parts (hinges, rollers, bearings, springs and the opener rail). 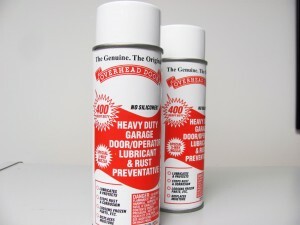 We sell a high quality very affordable door and opener lubricant at our facility. Falling temperatures during winter months can cause water to freeze around the bottom seal of a closed garage door. This can cause the bottom seal to peel or rip as the garage door opens. To prevent this, keep the front of the garage door clear of snow or ice. The weather seal is intended to keep cold air out, and if damaged, should be replaced immediately to prevent an expensive heating bill and uninvited varmints. If your door seal is damaged this winter, contact Overhead Door to coordinate service. Not sure what the issue is? Contact Overhead Door in Iowa City or Cedar Rapids. We will dispatch a tech to coordinate repair or replacement. Our technicians carry most replacement parts and accessories with them at all times, and most likely can do the repair that day. The best part about our technicians and our quality service is we are readily available to help you when you need it most. Call any time of day, 24/7 and we will get your repair issues taken care of. In fact, if you call before 10:00am (Mon-Fri) a technician will visit you before the end of the day! SAME DAY SERVICE. To request service, call Overhead Door in Cedar Rapids at (319) 363-9976 or in Iowa City at (319) 338-9747. Or contact us toll free at (800) 393-9976. You can also submit a service request via our website. As the leaves begin to fall and the winter months approach, it’s important to winterize the garage door against another harsh Midwestern winter. 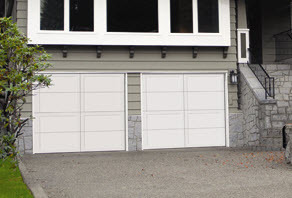 The residential garage door is most often the largest and frequently traveled entrance of a home. The following tips will help improve your heating bills, energy loss, and keep your garage door and opener in reliable working condition all winter long. Begin the winterizing process by inspecting the bottom seal, also referred to as the astragal, of the garage door and the all-weather seals around the side and top of the garage door. While the garage door is shut, inspect the bottom from the inside. If light or cool air comes through beneath the seal, it may be a result of a rip or tear along the seal. Raise the garage door a few feet and check seals from the outside of the garage. If any noticeable rips or tears exist, replace your seals! You’ll be money ahead. On most new garage doors, replacing the bottom seal is done by simply sliding the astragal off and replacing it with a new one. (Double wide doors are more challenging) Bottom seals can be found at any home improvement store or through an Overhead Door dealer. It is best to take a sample of your bottom seal with you as there are a number of different styles. Older wood garage door astragals are nailed on. To replace, carefully pull out the nails and replace the astragal with a new seal and nails. If your door is in need of a new all-weather seal, remove the old seal, measure and cut a new seal, and replace the seal and carefully nail back on. For a demonstration and more detailed instructions on how to replace weather seal watch a demonstration video here. Don’t want the hassle of replacing seals yourself? Give Overhead Door a call and we’ll schedule Same Day Service. We can replace your weather seals and do basic door and opener maintenance at the same time. Not a bad idea if it has been a while since you have had your door serviced. A huge amount of heat escapes through the garage door if it is not insulated properly. Is your garage door insulated? If not, it’s time to consider a new energy efficient garage door like our Thermacore Series. Online tutorial videos suggest ways to insulate the door with glued pieces of insulation. Avoid this ineffective insulation method and consider replacing the garage door. Overhead Door of Cedar Rapids and Iowa City wants to help you save energy costs. We would love the opportunity in assisting you upgrade your door and opener system. Imagine being stuck in the driveway during sub zero weather because of a dead remote or keypad battery with a car full of small children and groceries. The final step to preparing your garage door for winter is to check and replace the batteries in all remotes and the keypad. New batteries are sold online and at many dealers. If you own an Overhead Door brand garage door opener system, simply bring your remotes to our showroom and we will replace them FOR FREE! FREE BATTERIES FOR LIFE! • Avoid leaving the garage door open for any length of time. Any type of cold air infiltration will affect your homes heating efficiency. Our goal is to minimize winter air from hitting the inside walls of your house. • Shut the garage door prior to entering the house. Drafts can flood the home with cold air causing the heat to kick on and work harder to warm the home. • Insulate garage walls. Interior attached garage walls especially need insulation. If you are not experienced installing insulation, it may be a good idea to hire a professional. • Inspect and replace worn or torn weather seals on the walk in door between the house and garage. Getting your residential garage door winterized as soon as possible this fall will ensure the garage is ready for the elements when the first freeze hits the Midwest. To contact Overhead Door for more information about garage door maintenance and winterizing, click here or call 319-363-9976 (Cedar Rapids), 319-338-9747 (Iowa City) or toll-free 800-393-9976, Monday thru Friday, 8am to 5pm. The garage door is important in the form and function of your home. A well-maintained garage door adds value to the home by improving curb appeal. A garage door also serves important functions, such as securing your home or making entry easier—which go invisible when operating correctly. As you recover from the harshest winter on the books in most parts of the country, you will want to do a spring check of your garage door systems. The key to garage door maintenance is catching any potential problems early. You want to inspect your garage door for wear-and-tear issues and operating malfunctions. Your garage door is the single largest moving part of your home and requires regular maintenance. You want to inspect the wear-and-tear of your garage frequently, perhaps once every month. But these kind of inspections can be particularly important following the severity of winter weather. You want to check the inside and outside of your garage door. Inspect the door itself (from both the inside and outside) for any cracks or damage to the material of the door. A garage door can absorb water as it melts off the garage (which can also freeze inside the door adding extra wear-and-tear during normal usage in winter months). As the weather is warming, it is a good idea to keep the garage door up for extended periods of time so that this water can drain from the door. If you notice any damage to the door, you want to contact a professional to do a more thorough inspection and get an estimate for repair. Fixing a problem with a garage door earlier can save you a lot of money. After checking for damage to the actual door, you want to check the other components of the door. Check all hinges and metal parts for rust. Make sure that any sealing agents, like the rubber trim along the bottom, are still in-tact and in operating condition. These can be easy fixes to simple solutions that will save you time and money down the road. If you are not comfortable making any of these repairs, then you will want to consult a professional for assistance. When you are confident that the garage door is fully functional, then you will want to follow with an inspection of the opening system. Check all tracks and cables. You want to look for any fraying in the cable system of your garage door. The good condition of your garage door cable is important because not only can a malfunction of this component be quite costly to fix (particularly given the relatively inexpensive solution of changing a cable), but a cable snapping can be quite dangerous as the garage door is likely to slam shut. You want to look for any bending or rusting in the tracks of the garage door. Once again, this is both an operational and safety concern. You can also do a general sound check of the garage door. Open and close the door multiple times (while standing in different places around the garage) and listen for irregularities. A garage door that makes grinding noises is not functioning properly. If you notice any issues with the movement system of the garage door, then you will want to consult with a professional. Combination Hinge and Rollers. Use a generous amount of engine oil to prevent these components from jamming up or sticking. The key is to apply the lubricant liberally. Hinges in the Field or Center of the Door Panels. You can use either an engine oil or lubricating agent such as WD-40 to lightly lubricate these components. You do not need to use much of the oil. You just want to lightly wet, and not saturate, these parts. Lock Mechanism on the Door. You want to just use a simple lubricating agent, such as WD-40 in and around the locking mechanism of the door. There are several tests that you will want to run for garage door opener maintenance. You will want to begin by testing all of the power sources for your garage door. Primarily, you should use spring cleaning as an opportunity to replace any necessary batteries for your garage door. This is a simple and inexpensive garage door opener maintenance task. Next you will want to run a series of tests to inspect the operation of your garage door. It is important that your garage door is fully functional (and passes all of these tests) for the health of your garage door and the safety of your family. Door Balancing Test. Disengage the automatic garage door opener. You want to manually lift the garage door so that you can feel any difficulties or threats to the smoothness of the open. You also want to make sure that the door is balanced such that the door will stay open even with the system disengaged. If the door will not remain up or there are any bumps or difficulties in opening the door manually, then the balance of the door is off and requires further garage door opener maintenance from a professional technician. Reversing Mechanism Test. You want to open your garage door fully. You next want to place a sturdy object, such as a 2×4 piece of wood, at the base of the garage door. Close the garage door using the automatic opener and make sure that the door does not fully close onto the object. Your garage door is designed to not close when it detects the resistance. If your garage door does not reverse when an object provides this resistance, then you will want your garage maintenance completed by a professional. Photo Eye Test. You begin this test with the garage door fully open. You want to close the garage door using the automatic opener. As the garage door is closing, you want to wave an object, such as a broom or piece of wood, in front of the photo eye system at the base of the garage door. You want to make sure that this safety feature of your garage door is operable. If your garage door does not reverse the process of closing, then you will want to consult a professional technician. Force Setting Test. You want to be sure to complete this garage door opener maintenance test after all of the other tests for safety reasons. You begin with the door up and close the garage door using the automatic opener. As the garage door is closing, you want to hold your extended arms under the garage door and provide resistance. You want to catch the bottom of the garage door and provide resistance. If your garage door does not reverse and open, then the force settings could be set inappropriately. You will want to consult the manufacturer’s manual and a professional technician for correction. If your garage door does not pass each of these garage door opener maintenance tests, it is important that you refer to the manufacturer’s manual and contact a professional. The safety of your family could be at stake. As a general rule of thumb, you probably want to consult with a professional when repairing or altering your garage door—particularly the garage door opener. In addition to a professional, you also want to refer to the manufacturer’s manual because it will contain key information in the maintenance of your garage door. For example, the year of your garage door will inform the features of your garage door; garage doors built after 1993 are mandated to have an operable photo eye at the base of the track. The information in the manufacturer’s manual will not only describe optimal performance, but it will give insights into the likely malfunctions of the system. The manufacturer’s operating manual is essential in garage door opener maintenance. The garage door serves aesthetic and functional purposes. It keeps your house locked up from intruders. It makes your easily accessible to you and your family. And it contributes to the general appeal of your home. Spending an afternoon on garage door maintenance is an investment you cannot afford not to make. First impressions are important. This tried-and-true American ideal is true in professional and personal contexts. And the hit HGTV series Curb Appeal has solidified the importance of a first impression on real estate. The perceptions that someone will have about your house are first developed based on what your home looks like from someone standing on the street. And no single feature of your home has a greater impact on the curb appeal of your home than a new garage door. The garage door is one of the single largest features of your home and an upgrade to your garage door can directly increase the value of your home. The value of your property is determined by many factors: location, square footage, features, and appeal. Some of those factors are fixed. You are unlikely to move the location or neighborhood of you home. And major renovations, such as remodeling or an addition, can be expensive ways to increase the value of your home. One of the most important, and sometimes subtle, contributors to the value of your home is the curb appeal. Realty expert Kathy Price-Robinson argues that the outside of your home directly impacts how the inside of your home is perceived. In fact, many potential homebuyers will not even walk into a house if they do not find the home appealing from the curb. In an interview with ABC News, Dave Seymour, property improvement expert and star of A&E’s hit Flipping Boston, argues that a functioning and appealing new garage door can yield a 400%-1000% return of investment. A new garage door is a solid way to increase the value of your home. 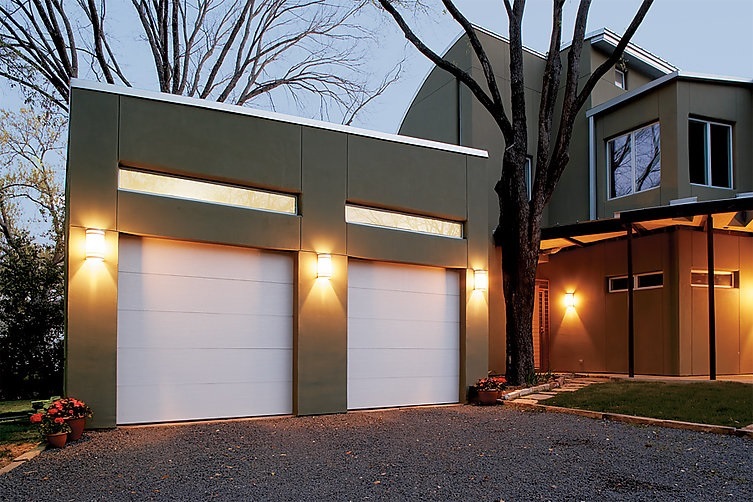 If you wish to improve the value of your home, you should strongly consider a new garage door. A recent survey of 300 realtors found that a new garage door can increase the value of your home by up to 4%. This is a simple way to make big dollars and can be done in just 3 hours. This is one of the few improvements on a home that sees a complete return in investment. According to Remodeling Magazine’s annual report on national trends, a strong return of investment of a home improvement is just above 60%. Installing a new garage door has a much higher return of investment and is one of the top ways to increase the value of your home. For anyone worried about the resale value of a home, it is not a matter of if to install a new garage door, but a matter of when or which garage door to select. When selecting a new garage door, there are multiple things to consider. Home improvement expert Bob Vila argues that when selecting the correct door, you want to start with what you already have: your home. The garage door, color and style, should be selected to match the style of your home. You can use architectural details such as windows or material to seamlessly match a garage door to your home. When selecting a color, you can opt to have the garage door blend in with the palate of your home by selecting more neutral colors such as tan or white, or you can have your garage door add a pop of color to your home by selecting an accent color, such as hunter green. As long as you pick a new garage door that is appropriate for you home, you are sure to increase the value of your home (and make your neighbors envious of your newly gained curb appeal). Given the significance of curb appeal when assessing the value of one’s home, you should not stop with the new garage door. A well-manicured lawn, including grasses, shrubs, and flowers, can also give the perception that you care a lot about your home. This perception will impact how the inside of your home is perceived. Having defined walkways and proper lighting will also increase the value of your home by highlighting the positive features of the home and instilling a sense of security to all potential buyers. These curb appealing tips, along with a new garage door, can contribute to an increase in your home’s value. There are very few guaranteed ways to improve the value of your home. Most of them center on improving the curb appeal of your home. Not only does an attractive home from the street attract more buyers, it also improves perceptions of the inside of the home. A new garage door is an easy and efficient way to increase the value of your home. To view new garage doors, visit Overhead Door Company of Cedar Rapids and Iowa City product line. Is your garage door making annoying, mysterious noises? Are you concerned that one day it will not open and you will be temporarily trapped? At Overhead Door, we have heard countless stories from homeowners with door and opener issues. VERY important to help the homeowner navigate smart money choices regarding replacement vs. repair… Whether you need to repair your garage door, your door opener or just need a new quiet opener installed, this blog will help guide you to some quick and fairly easy fixes for your noisy garage door and opener system. Regular Maintenance. When unusual noise is coming from your automatic opener system, inspection of the unit is essential (preferably by a professional). A well-maintained garage door opener will run efficient and quiet. There are a number of possible adjustments and lubrication points. Gears and sprockets can also wear over time causing noise and friction. If an opener chain is out of adjustment it can also add to your noise issues. New Quiet Garage Door Openers. 15 years is a good life for a garage door opener. If your unit is over 20 years old it may not have proper Safety Sensors and Rolling Code technology (enhanced safety and security protection newer opener systems have). We don’t generally recommend repairing the older units as there have been so many technical and safety improvements in recent years. And the repair cost and availability of parts often outweighs the modest investment of a professionally installed new unit with a full local warranty. In these scenarios, we recommend upgrading your opener to a new unit such as an Odyssey 1000 by Overhead Door. The new DC motor system will really impress you with its quiet, smooth operation. The opener is available with either a belt or chain drive. If you are looking for the Cadillac, we recommend the belt drive opener. This is an excellent choice if you have a bedroom located above a garage or have a teenager in and out at all hours. The powerful DC motor (identical in both chain drive and belt drive) is MUCH quieter than the older AC powered units. 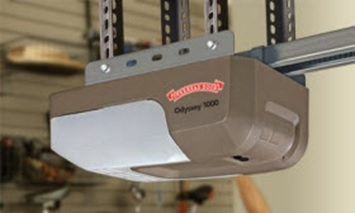 Overhead Door’s automatic opener systems are designed for years of reliable performance and come with the industry’s best warranty… These garage door openers are quiet, powerful and durable. When it comes to replacing your garage door opener we highly recommended consulting an established professional garage door company. For more information about amazingly quiet garage door openers, contact the professionals at Overhead Door of Cedar Rapids and Iowa City. Common causes of noisy garage doors are worn rollers, loose hardware, squeaky or broken hinges. There are several simple things the homeowner can do to quiet down your door system. First, start with tightening all nuts and bolts on your garage door. Remember not to over tighten the bolts, this can strip the screw holes or pull the bolt head right through the door skin. Next, inspect for worn parts such as rollers and hinges. It is common that steel rollers with unsealed bearings become worn after a few years. If the roller wear gets severe, it can actually wobble in the track as the garage door operates. When the steel rollers wear out, you may want to consider replacing them with nylon rollers. Nylon rollers are MUCH quieter than steel rollers, and 13 ball bearing rollers are a better bang for the buck than 7 bearing rollers. (even though they cost a little more) The rollers are your doors automobile tires. Bad tires equate to a bad ride. Worn hinges aren’t as common as roller wear, but when hinges become sloppy or bind, door squeaks and groans can accelerate… Bad hinges can also cause the garage door sections to bind and even damage the door panels. Lubrication of the roller bearings, hinges, and springs (with the proper garage door lube) is the easiest and most effective maintenance the homeowner can do..A little bit of lubrication goes a long way… Lightly lube all pivot point areas. Lubricating these moving parts once a year will keep your door system quiet and often extend the life of springs and rollers. For more information about regular maintenance or servicing a noisy garage door, contact the professionals at Overhead Door Company of Cedar Rapids and Iowa City. Your garage door is the biggest entrance to your house, making it a huge liability in the face of cold, harsh weather and a potentially huge drain on your energy efficiency. Make your garage door a priority on your list of winterizing projects this year. Let us help you with this quick guide! A garage door with failing bottom seal and all weather seal will let snow and ice blow in all over your garage, not to mention air infiltration. Examining this aspect of your garage door should be your first order of business. Close your garage door and inspect it from the inside. Do you see any light shining through anywhere? Next, run your hand along the perimeter. Do you feel any air coming through? Make a mental note of any problem areas. Now open your garage door about halfway and inspect it from the outside. Do you see any rips or tears along the bottom seal (also called an astragal)? Examine the all weather seal along the sides and top of the door. Any tears or gaps? If your door does not have all weather seal that should be a priority. If the astragal needs to be replaced, open the door all the way. With newer garage doors, you can usually simply slide the astragal off the retainer and replace it with a new one, available at a home improvement stores or through your Overhead Door dealer. (Note it is important to make certain you purchase the appropriate seal…different door manufacturers produce different bottom seals) With older wood garage doors, the astragal may be nailed on – simply remove the nails and nail on a new one. Close the door and make sure no light or air is coming through. Replacing all weather seal is a bit more involved, but doesn’t usually need to be done as often as replacing the astragal (bottom seal). Again, all weather seal can be bought at any home improvement store or through your Overhead Door dealer and is available in many colors. Pick the one that matches the trim on your house. Pull off the existing weather seal with a hammer or crowbar. Measure the sides and top of the garage door opening, and cut the replacement seal down to size with a hacksaw. Then simply nail it into place. For a demonstration and more detailed instructions on how to replace weather-stripping, check out this video. Is Your Garage Door Insulated? If your garage door isn’t insulated, you would be money ahead to replace it with one that is. In modern homes the garage is usually attached to the house, and a huge amount of heat can escape through the garage door if it is not insulated or has a low R-Value. Many online tutorial videos show how to insulate a non-insulated garage door by cutting pieces of insulation and gluing them onto the inside of the door. Not only is this unsightly and highly susceptible to rips and tears, but it’s just generally an imperfect and ineffective insulation method. You can try it if you want, but save yourself the headache and the heating bill by getting an energy efficient insulated door from Overhead Door Company of Cedar Rapids and Iowa City! Make sure to check the batteries in your remotes and keypad before winter. If you’ve been a homeowner for a few years and can’t remember changing your garage door remote and keypad batteries, it’s probably time to do so. Simply open the casing on the remote or keypad with a screwdriver, pull out the battery and replace with a new one (available at battery dealers or online). Overhead Door Company of Cedar Rapids and Iowa City offers Free Batteries for Life on Overhead Door brand remotes and keypads…You just have to bring the unit to our showroom. The importance of winterizing the biggest entrance to your house cannot be over emphasized. No one wants high heating bills, snow or ice blown in the garage, or worse yet, stuck in your driveway in the rain and snow with a dead battery. Winterize now, and your garage door will turn in top performance and reliability all year long. Winterize Your Garage Door Today! For more information about garage door maintenance and winterizing, click here or call 319-363-9976 (Cedar Rapids) 319-338-9747 (Iowa City) or toll-free 800-393-9976 Monday thru Friday 8am to 5pm. Choosing an insulated garage door is the first step to keeping your garage and house energy efficient through the heating and cooling seasons. But choosing an insulated garage door is not all you need to do in keeping extreme temperatures out. Check out the tips below to get the most from your insulated garage door. They will likely reduce heat and air loss if you have an attached garage…not to mention reducing your utility bills. Doors, windows, garage doors and even the foundation can allow outside air to seep into your garage and let your temperate air to escape. Check for air leaks with a quick hand test and seal up windows or holes with caulk or spray foam. Also check your entry door and garage door seals. The garage door bottom seal and perimeter seal should fit properly with no air or light gaps. Find the right R-Value for your area. The R-value of insulation is measured by the amount of heat the insulation is able to resist. The higher the R-value, the more thermal protection your garage will have against wind and extreme temperatures. For garage ceilings, choose an R-value of 38 or higher when installing insulation. For walls, choose insulation that is at least an R-13 value. Choose a reputable door company to install and service your doors. When buying a garage door, your r-value will be important but proper installation is crucial. Garage floors can be uneven and garage doors will wear prematurely if not installed properly and well-maintained. Choose your doors from a door company that has a knowledgeable staff and service department. Overhead Door Company of Cedar Rapids and Iowa City, has expert service technicians available 24/7 to make sure your doors and openers are always working properly through every season.